Hamilton woke. His mind was drifting in thick fog. He was lying flat on his back. A pleasant female voice was requesting, “Please state your name.” He tried to speak, but he couldn’t. He couldn’t even breathe. He started to panic and forced his hands to move toward his face. His arms felt like they were made of lead. He felt a mask covering his mouth and nose. A bitter, antiseptic taste filled his mouth. His heart was racing. Then his training took over. He was waking from Suspended Animation Sleep. He opened his eyes. His surroundings were fuzzy. He looked up and saw a bright red button just above his head. He willed his right arm to move. Slowly, at first, then faster, until he hit the button like a volleyball player doing a one-armed dig while lying on his back. It was exhausting. Hamilton could feel a tube in his throat vibrating, followed by a pumping sound from above his head. After a few moments, a chilling sensation spread through his chest. A buzzer sounded and the clasps holding the mask to his face opened with a loud metallic click. He mechanically raised both hands to the mask. His arms didn’t feel as heavy now. He tilted his head back and removed the mask from his face exactly as he had been trained. A long tube slid out of his throat. The chilling followed the tube up his throat, all the way out of his mouth. His throat and mouth were numb. Hamilton’s chest began to hurt as his body begged him to take a breath. He took one shallow breath and coughed immediately. He knew the Suspended Animation Sleep oxygen gel would evaporate in the presence of nitrogen gas. All Hamilton had to do was breathe, but he struggled at first. Each shallow breath became a little deeper until he could breathe normally. He could finally answer the computer’s insistent request to state his name. “Commodore Eugene Hamilton,” he said after a few false starts. Hamilton’s excitement overcame his body’s cries for mercy. He struggled to move at first, but eventually, he sat up in the Suspended Animation Sleep bed and found three pills in a metal dispenser. He checked to make sure his body was completely disconnected from the bed, grabbed the sealed cup magnetically attached to the bedside, and took the pills. He noted the engines must be working since he wasn’t floating off his bed. Hamilton felt the stimulants start to work immediately. His vision was less hazy. As the fog lifted from his sight, he began to think more clearly and explore his surroundings. He was in a familiar room surrounded by six beds containing his crew. Each bed had a bright green light on it, signaling all was well. After struggling to put on his flight uniform for a few minutes, he left the crew quarters and entered the command deck. “I can’t ask for better than that,” Hamilton said to himself. He then looked around the command deck, remembering the long hours he had spent training there and in simulators for this moment. Hamilton wanted to be remembered as the person who had led the first successful colonization of an exoplanet. So much was riding on this mission. After the failed colonization attempt at Proxima Centauri and the discovery of a lack of colonizable planets near Earth, this mission would either prove that humanity had what it takes to become a citizen of the stars or that it should remain forever trapped in its solar system. Hamilton took a deep, calming breath and noticed his reflection in one of the side panels. Eighty years of travel time hadn’t changed him much. His light brown hair was a little shaggy but otherwise looked the same. He stood up next to his chair to gauge his height. He still seemed to be 192 centimeters tall. He hadn’t gained any weight. He had never been fat or muscular. He had turned forty just before the trip began, but he didn’t see much of a change in the way he looked, aside from needing a shave and a haircut. Then he looked at his hands and added trimming his nails to his mental list. Hamilton sat down and brought the main view screen online. He sat back a moment as he took in the view of this new system. The wondrous new worlds he had dreamed about for a decade made a hazy shadow against the faint ultra-cool red dwarf star, the Trappist system. He had trained for this mission for five years, and now the story he had played over in his mind so many times was all unfolding before him. Hamilton took another few moments to drink in the view before getting to work on the most important job in this star system. “It’s also the only job in this star system at the moment,” he said to himself with a laugh. It was time for Hamilton to start the series of scripted events that would prepare his crew for exploring these new worlds. “Exo-1,” Hamilton commanded the ship, “wake Major Nguyen.” Major Jennifer Nguyen was second-in-command over this mission and the lead science officer. “It’s not polite to remind a lady of her age,” Nguyen said. “To Trappist!” Hamilton said before drinking a long swig of water and returning the sealed cup to its magnetic coaster. Nguyen took over gathering the data files from the probe network while Hamilton began waking the rest of the crew. “Exo-1, wake Captain Schmidt.” Their medical doctor, Captain Hans Schmidt, MD, came from Trans-European Germany where he had earned acclaim for improving the health of soldiers in orbit for extended periods of time. He held degrees in medicine and computer science. Everyone called him Doc. “Hi, Doc. How are you doing?” Hamilton asked when Doc entered the command deck. “I’ve been worse,” Hamilton replied. Doc was moving slowly but standing straight. His graying chestnut hair was a mess, but he looked fine otherwise. Third in command was Captain Simone Dubois, a French national. Simone looked more like a supermodel than one of the best xenobiologists on Earth. Her papers on the possible types of life on exoplanets had been required reading for most graduate students of xenobiology when the crew had left Earth eighty years ago. As Dubois entered the command deck, Hamilton asked, “How are you feeling, Captain?” She was slightly stooped over as she walked, making her look shorter than her actual 185-centimeter height. Her long, wavy brunette hair was tied back in a ponytail. Dubois let out a long groan before dropping into the seat in front of her console. “Why did you drag me along on this mission?” she asked in a thick French accent. Her piercing green eyes were regaining their sparkle. The only civilian member of the crew, Topolov was an excellent oceanographer and geologist. His extensive list of accomplishments in land and sea disciplines made him a perfect addition to their planetary exploration team. Then Master Sergeant James Johnson, an African American from Atlanta, Georgia, entered the room. He stood tall and straight; his eyes were sharp, and he looked ready to run another 10 K race. “How are you holding up, Master Sergeant?” Hamilton asked. “I’m not 100 percent yet, but I’m ready to roll,” Johnson replied. The final crew member to awaken was Technical Sergeant Samantha Lambert. She walked onto the command deck like she was just returning to work from a nap, refreshed and ready to go. Her short, dark chocolate brown hair was a mess, but that wasn’t unusual for her. “How are you doing, Technical Sergeant?” Hamilton asked. “I’m chipper, sir. How are you?” Lambert asked with a slight English accent. Lambert joined Johnson in the equipment bay behind and below the command deck. Johnson had half the avionics panels open and was pulling modules out. “What’s this about, Johnson?” Lambert asked. “I hope you’re luckier than I am.” Johnson often made jokes about his bad luck. “Thanks, Samantha. That really cheered me up. “Good. I don’t like working with sulky slackers,” Lambert said with a smile. “It sounds better than unisex vac toilet,” Lambert said as she left the room. Doc decided to speak with Topolov to see whether he was being melodramatic in the way he was shuffling about the ship, or whether he was hiding something more serious. “Fair enough,” Doc replied, “but do you know why I came here, Alexi?” Topolov looked up from his console but didn’t say a word. “To keep all of you alive.” Then Doc walked back to his console and went to work. Nguyen and Dubois were organizing the probe network’s data. “I’m so sorry, Simone,” Nguyen said. Nguyen sat up straight and said, “Do you see what I see?” They both stopped talking and began sending messages between themselves. Nguyen and Dubois were always talking. Hamilton usually tuned them out as he worked until they became unusually quiet. Then they started sending messages to him. The probe data was disturbing. He messaged back to Nguyen that she should share it with the crew. “On what planet?” Topolov asked. “Were there any biological contaminants found?” Doc asked. “What’s the plan, sir?” Johnson asked Hamilton. “I think it makes sense to try to find out what happened from orbit,” Dubois said. “I agree,” Topolov and Nguyen said. The doctor just shrugged his shoulders. Johnson and Lambert remained silent. “Let’s get started,” Hamilton said. “Will we follow the original mission protocol for our crew rotation and sleep schedule?” Doc asked. There were no questions, so Hamilton dismissed the crew. The crew quickly settled into a routine and looked less haggard after getting some sleep. 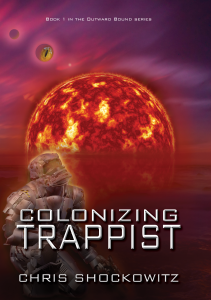 Excitement grew with each hour as they approached Trappist E. They not only had a mission. They had a mystery. “So, this civilization was alive and well when we left Earth,” Doc said. “That’s what the data suggest, Doc,” Nguyen said. “If a natural disaster happened on the planet, the crew could have been evacuated,” Doc said.